A 25-year-old Falmouth man was placed under arrest early this morning at the scene of a Hyannis fire. At about 12:20 am Barnstable Police were called to the newly built Hyannis Fire Station on High School Rd. for a piece of construction equipment on fire. Arriving officers found an excavator fully engulfed in flames, along with two smaller fires located under temporary office trailers. subject inside the fenced construction site and pursued him on foot to an adjacent pharmacy. 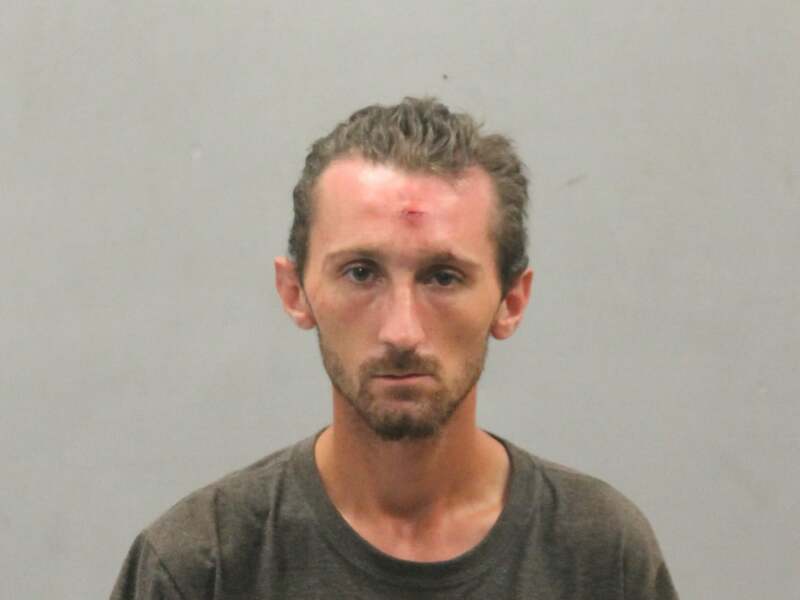 The subject was identified as 25-year-old Allen Beckwith of Falmouth. Hyannis Fire Department responded and extinguished all fires, and Barnstable Police Fire Investigator, Detective Sergeant John York, was called to the scene. proceeded to set two fires under the mobile offices in addition to setting the excavator on fire. Beckwith was placed under arrest at the scene and was charged with three counts of Arson, Breaking and Entering in the Night with Intent to Commit a Felony, Trespassing, and a Probation Warrant. He will be arraigned in Barnstable District Court this morning. HYANNIS – [DEVELOPING] – As you will see in the following HN Video, an excavator went up in flames behind the new Hyannis Fire Department early this morning. Shortly after midnight, Barnstable Police squad cars rushed to investigate the blaze behind both Hyannis Fire Departments, the old and the new. HN arrived right as the first patrolman arrived and the excavator was fully engulfed. Moments after arrival, the patrolman noticed a man walking through the back of both fire departments. The patrolman called for the man to stop but he kept on walking in the opposite direction. HN began rolling on footage as the officer caught up to the man near the CVS that neighbors the fire department. Firefighters drove an engine from the front of their department to the rear and began attacking the flames. As you will see in the following HN Video, as soon as firefighters knocked down the excavator fire, an alert Barnstable Patrolman noticed another fire on the opposite side of the property. Upon investigation, officers and firefighters discovered two separate small fires next to a couple of construction trailers and quickly began to put them out. HN spoke with sources on scene and it is not believed the two additional fires could have been caused by the primary excavator fire. Police and firefighters began investigating the scene as an arson… and a special arson investigator was immediately called to respond. As you will see in the HN Footage, early into the investigation officers had a suspect detained and placed him in the backseat of one of the squad cars. The arson investigation is still very active and ongoing, but sources tell HN that the suspect is looking at trespassing charges at the very least at this point. At the time of this report, it remains uncertain whether the man you see in the following HN Footage will also be charged with arson… but he is considered to be a main suspect at this point. HN NOTE: As an aside, when viewing the footage the suspect appears to be wearing some sort of GPS monitoring device on his left ankle. At this time, it remains uncertain as to why he’s wearing what appears to be some sort of court ordered ankle bracelet. * All suspects are presumed to be innocent until proven guilty in a court of law.